“From the internationally bestselling author of four books, including The Opposite of Me, a vibrant, compulsively readable novel about two married couples who pursue a dream to open a bed-and-breakfast in small-town Vermont. 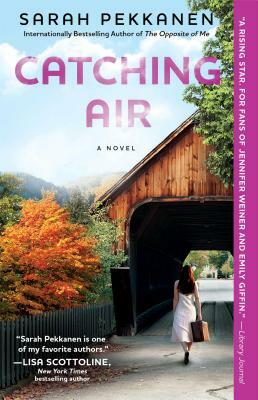 Catching Air (May 6, 2014) is Sarah Pekkanen’s latest Women’s Lit (not a fan of the term “Chick-Lit”) novel about starting over and having a second chance at happiness. Sometimes what is romanticized about fresh starts and new beginnings just becomes another reality of life’s challenges. After reading some heavier novels this month regarding World War II, kidnapping, sexual abuse and murder, it was refreshing to delve into a story about regular people with regular problems. Whatever “regular” is. Some might call it fluff but topics such as rocky marriages, adoption, infertility, deception and familial tension are not necessarily a light read. Pekkanen writes in a way that the reader can relate to. She is current with references, adds touches of humility and humor while still focusing on the topics at hand. There is some suspense with the addition of character Dawn who is hiding a big secret and running away from someone who hurt her. She finds the B&B and the kindness of the owners to be the perfect hiding space. But will fate and the person she is hiding from catch up to her? The tense and strained relationship between brothers Rand and Peter thankfully don’t carry over to the budding relationship of wives Alyssa and Kira who seem to welcome the new found friendship. The ending left something to be desired, so maybe a follow-up story is in the works. It just seemed to end abruptly and left me wondering what happened with the some of the major topics the novel focused on. Fans of Sarah Pekkanen won’t be disappointed with her newest Contemporary Fiction novel about family and relationships. *Thank you to Washington Square Press, Atria Books, Simon & Schuster, NetGalley and Edelweiss for the advance, uncorrected reader’s proof. I was not compensated or required to review this novel. To find out more about Sarah Pekkanen, her books and events, please visit her site here. Tags: adoption, Chick-Lit, marriage, May 2014 new releases, starting over, Women's Lit. Bookmark the permalink.